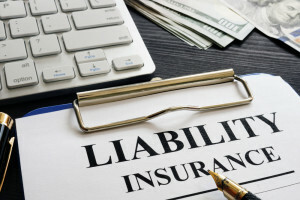 Commercial general liability (CGL) policies for contractors traditionally contain a professional liabilities exclusion. This exclusion is generally added through a specific endorsement to eliminate coverage for professional services. Read the endorsement The point of the exclusion, in a nutshell, is simply to eliminate a CGL policy for a contractor serving as a professional liability policy. Contractors need to appreciate a professional liabilities exclusion added through endorsement because oftentimes there are delegated design components they are responsible for. Perhaps the contractor value engineered a system and is responsible for engineering and signing and sealing the engineered documents (through its subcontractor) associated with that system. Perhaps there is a performance specification that requires the contractor to engineer a system. Perhaps there is a design-build component. Regardless of the circumstance, this professional liabilities exclusion can certainly come into play, particularly if a defect is raised with the design or professional services associated with the engineered system. Whether a professional service has, or has not, been rendered is a fact-intensive analysis. Thus, when deciding whether an act arises out of the rendering of or failure to render a professional service, the court must focus on the act itself and not the character of the individual performing the act. The act from which the claim arises must be related to a professional service that requires the use of professional judgment or skill. In this case, the insurer issued a CGL policy to a pharmacy. The pharmacy was sued in a negligence action. The pharmacy’s CGL insurer filed an action for declaratory relief claiming it had neither a duty to defend nor indemnify its insured (the pharmacy) since the underlying claims arose out of professional services and the CGL policy contained a professional liabilities exclusion. The Second District maintained, as to the insurer’s duty to defend its insured, that the insurer had a duty to defend the pharmacy (insured) in the negligence action because the allegations in the underlying complaint could be deemed unrelated to professional services. The Second District maintained, as to the insurer’s duty to indemnify its insured, that this duty is more fact-intensive and without sufficient discovery, there was a genuine issue of material fact as to whether the evidence brought the pharmacy’s conduct within the meaning of the professional liabilities exclusion in the CGL policy. Here, while the pharmacy will get the benefit of the insurer’s duty to defend since that is triggered by the underlying complaint, the duty to indemnify is different and triggered by the facts. 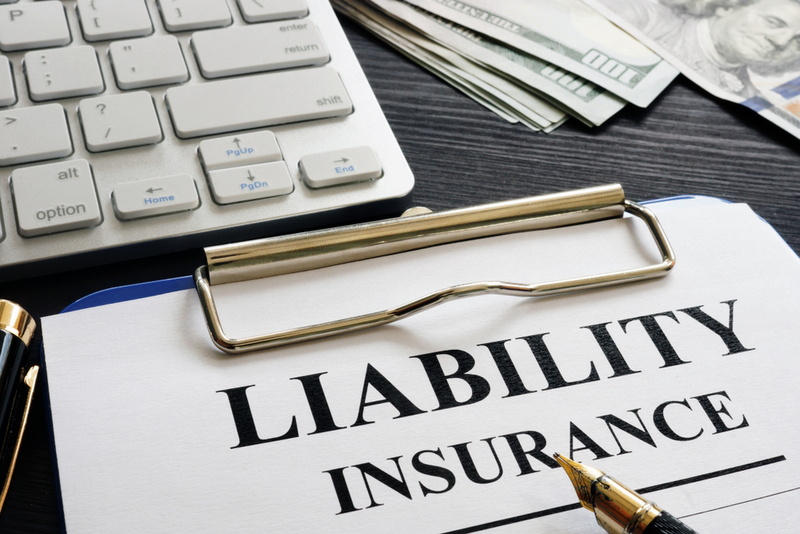 It is likely that the facts in this case trigger the application of the professional liabilities exclusion, meaning the CGL insurer does NOT have a duty to indemnify the insured for the damages proven against it. Not the situation an insured wants to be in! The good ole duty to defend. Certainly, a duty that should not be overlooked. A commercial general liability insurer has two duties to its insured when it comes to third-party claims: 1) the duty to defend its insured and 2) the duty to indemnify its insured. The insurer’s duty to defend its insured will always be broader than its duty to indemnify because this duty is triggered by the allegations in the lawsuit. (For this precise reason, insurers will oftentimes defend their insured under a reservation of rights.) 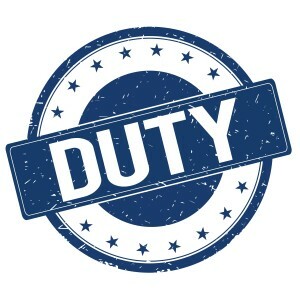 The duty to defend is a very important duty as it is the first duty that typically comes into play when a third-party claim / action is initiated against the insured. Getting the insurer on board to provide a defense is an initial focus. One that cannot be neglected or overlooked. If an insurer denies or refuses to defend its insured, this means the insurer is denying coverage outright. In other words, the insurer is coming out of the gate denying the duty to indemnify the insured and, as such, denying the duty to defend. There is no reservation of rights because the insurer is not going to provide a defense based on its denial of coverage. When this happens, it is imperative that the insured consult with counsel. Not later or tomorrow or down the road. But, now! Immediately. At a minimum, an insured wants to ensure that its insurer is picking-up the broader duty to defend and needs to make sure its rights are protected and preserved. In Mid-Continent Casualty Company v. Flora-Tech PlantScapes, Inc., 42 Fla. L. Weekly D1649a (Fla. 3d DCA 2017), a general contractor initiated a third-party claim against a landscaper in a personal injury action. (It is uncertain whether the landscaper was hired by the general contractor or the developer.) The landscaper’s commercial general liability insurer denied coverage and, therefore, refused to defend the insured in the lawsuit. 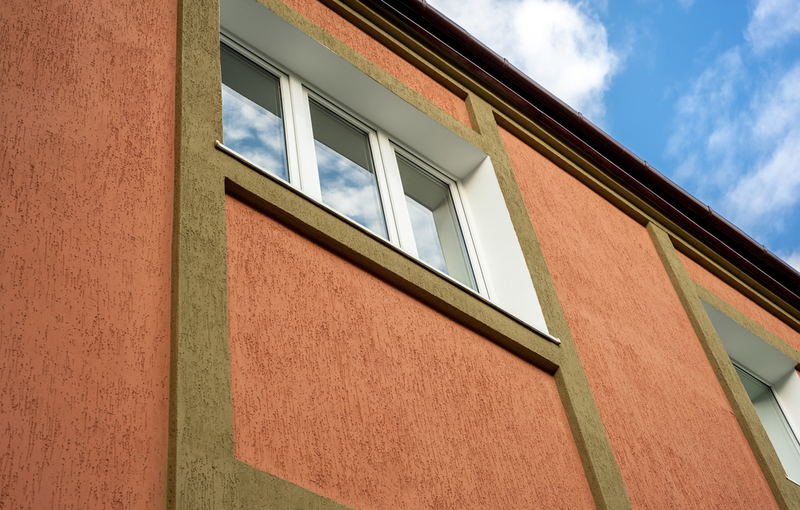 As a result, the landscaper initiated a fourth-party claim against its own insurer for coverage seeking a declaration that its insurer had a duty to defend it in the lawsuit and indemnify it for the third-party claims being asserted against it. Both the landscaper and its insurer filed motions for summary judgment and the trial court declared that the insurer had a duty to defend its insured, but that it was not making a determination as to the insurer’s duty to indemnify. From the insured-landscaper’s standpoint, this likely was fine because the landscaper was initially looking for a declaration that its insurer had a duty to provide it a defense in the personal injury action. Commercial General Liability (CGL) policies contain a CONTRACTUAL LIABILITY EXCLUSION (see adjacent picture). The contractual liability exclusion operates to BAR personal injury and property damage claims “which the insured is obligated to pay by reason of the assumption of liability in a contract or agreement.” Think indemnification claims which are assumption of liability claims and common in construction. But, and this is an important but, there are two exceptions to this exclusion. First, the contractual liability exclusion does not apply to liability for damages “that the insured would have in the absence of the contract or agreement.” Think tort claims. Applicable to construction, a key definition of an “insured contract” is “that part of any contract…pertaining to your business…under which you assume the tort liability of another party to pay for bodily injury or property damage to a third person or organization.” This portion of the “insured contract” definition should ideally bring contractual indemnification claims back into play so that contractual indemnification claims are not barred by the contractual liability exclusion. Be careful, though. There are endorsements to CGL policies that have modified the definition of “insured contract” to either remove the aforementioned definition all together, meaning contractual indemnification claims would be excluded. This is a bad endorsement to the definition of “insured contract” if you are involved in construction. 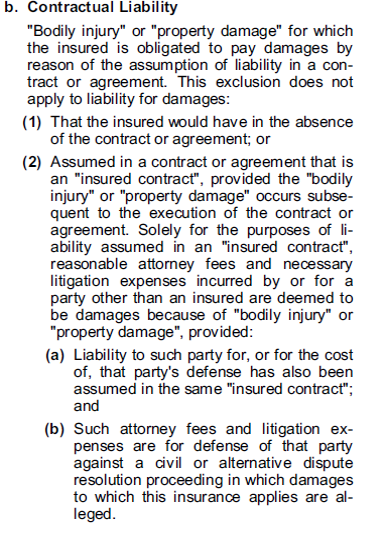 Or, this key definition of “insured contract” has been narrowed to include the following underlined language “that part of any contract…pertaining to your business…under which you assume the tort liability of another party to pay for bodily injury or property damage to a third person or organization, provided the bodily injury or property damage is caused, in whole or in part, by you or those acting on your behalf.” This means that if you contractually agree to indemnify another for that person’s negligence, this would not meet the definition of “insured contract” since you are agreeing to indemnify another for negligence not caused in whole or in part by you. In other words, the subcontractor was agreeing to indemnify the rental company for the rental company’s negligence. This is known as a broad form indemnification provision. During construction, a worker was hurt when a truss fell from the crane. The worker sued the rental company and the crane operator for negligence. The rental company and operator third-partied in the subcontractor based on the contractual indemnification provision in the rental agreement. However, the subcontractor’s CGL insurer denied coverage (and, thus, a defense in the lawsuit) based on the contractual liability exclusion. As a consequence of the CGL insurer’s immediate denial of coverage, the subcontractor entered into a Coblentz settlement agreement with the rental company that allowed the rental company to sue the subcontractor’s CGL’s insurer for its wrongful refusal to deny the subcontractor a defense and for coverage under the subcontractor’s policy. Royal Crane, supra, at *7. 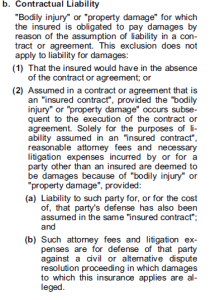 In other words, taking the above fact pattern, the indemnity agreement could constitute an “insured contract” to be excepted from the contractual liability exclusion if the worker’s injury was caused by the rental company’s (indemnitee) negligence, so long as the subcontractor (named insured in the CGL policy) caused some part of the injuries or was otherwise vicariously liable to the rental company for the injuries. Royal Crane, supra, at *7 (internal quotations omitted). For this reason, the Fourth District sided with the CGL insurer finding that the contractual liability exclusion barred coverage to the subcontractor such that the CGL insurer had no duty to defend or cover the subcontractor in the underlying litigation. This also meant that the rental company’s Coblentz settlement agreement provided it no value because it already agreed to give up rights to collect against the subcontractor and it could no longer collect against the subcontractor’s CGL insurer. What this case does exemplify, however, is the importance of pleading allegations to maximize insurance coverage as well as a more relaxed definition of an “insured contract” to hopefully prevent the application of the contractual liability exclusion.